“Minny Jackson” (Octavia Spencer) in The Help – quick witted, wise cracking opinionated maid, cook and caretaker for whites in the Jim Crow south during the Civil Rights era. Minny is the wife of a physically abusive, never seen husband, who has trouble holding jobs due to her uncontrollable outspokenness. – “You cookin’ white food, you taste it with a different spoon. They see you puttin’ the tastin’ spoon back in the pot, might as well throw it all out. Spoon too. And you use the same cup, same bowl, same plate everyday. And you put it up in the cabinet. Tell that white woman that’s where you gonna keep it from now on out. Don’t do that? See what happens.” –(speaking to her daughter, “Sugar”, before her first day on the job as a maid like her mother and grandmother before her). – “Minny Jackson” . 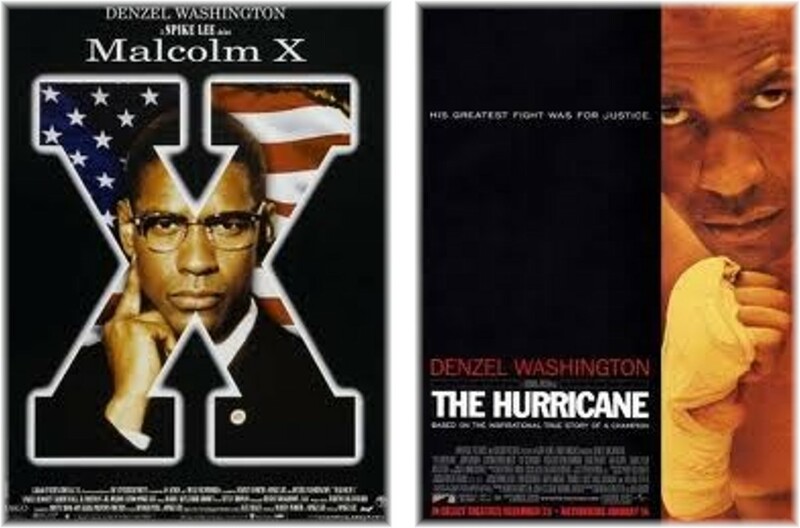 All of these performers were extremely convincing in their portrayals and all were deserving of their awards but was Training Day’s Denzel Washington really that much better than Malcolm X’s, Malcolm or The Hurricane’s, Rubin “Hurricane” Carter? Or was the Academy more at ease awarding an Oscar for the portrayal of a flawed fictional character rather than a real life figure who helped to expose America’s flaws? Am I reading too much into all of this? Perhaps. Perhaps not. 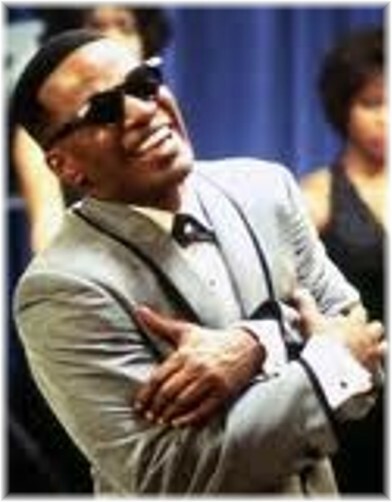 But the only place many in the white community would meet an “Alonzo Harris” would be in the movies. As real as the “Alonzo” is in some Black communities he is distant fiction in the white community and thus easily dismissed. Malcom X (later El Hajj Malik El-Shabazz) was real and he scared folk, especially white folk – and truth be told, some Black folk, too! 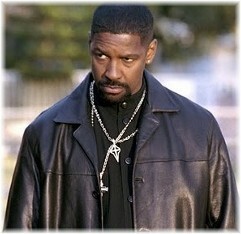 “Eddie ‘Scrap-Iron’ DuPris” (Morgan Freeman) in Million Dollar Baby – a not so cocky ex-jock. “Idi Amin” (Forest Whitaker) in The Last King of Scotland – the notorious Ugandan dictator who reportedly murdered no less than 80,000 people. Again, all well played parts and deserving of awards … but … do I really need to go on? Let’s look at Monster’s Ball for a moment. Did the standing ovation make those white men feel better? The white men who had father’s like the one the late Peter Boyle portrayed in the movie? The white fathers that told their sons they weren’t men until they “split dark oak”? What about the men – Black and white – who secretly harbored less than noble thoughts about Halle Berry? Did they feel better when they stood and clapped? What about those who wished and hoped they could change places with Billy Bob Thornton just for that one scene? Was their guilt for finding some degree of pleasure, crouched somewhere deep and hidden, in that animalistic sexual display of “Leticia’s” pain somehow washed away? Many southern whites, even The Help author, Kathryn Stockett were raised and nurtured by “Minnys”, “Aibileens” and even Hattie McDaniel’s, “Mammy” from Gone With the Wind. Was the ovation some way to say thank you? Hell, was the book itself a big “thank you” letter from Stockett to Demetrie, her family’s “Help” in Mississippi for generations? And were those who clapped so feverishly as so many additional signatures upon that letter? Look, I may have only stirred up a lot of questions but for now, that’s all I have. One of the biggest questions about The Help was raised by Karina Longworth in her piece in the Village Voice: “Why do little white girls who are raised lovingly by black maids turn into raging racist a**holes once they’ve grown to run their own households?” Or let’s take one more trip back to the Awards show when Chris Rock mentioned that a white voiceover actor can portray an Arabian prince but a Black voiceover actor is relegated to “donkeys or zebras”. Yes there was a small amount of nervous, uncomfortable laughter but the question still remains unanswered. Why is that? Are those fair questions? Why does this race thing perpetuate and replicate and, at times, reinvent itself? I think it’s because we won’t have the conversations and we continue to let the opportunities to have those conversations pass us by. We refuse to be uncomfortable for more than about two hours or whatever the average length of a feature film. I don’t have the answers nor do I claim to … and neither do you. But we, you and I, do have the answers. In fact, we are the only ones who can solve the problems but we will never find solutions to issues we refuse to confront. I’m not looking to blame any one. I’m looking for peace … wanna help? * – The multiple camera angles and views to which we have grown accustomed were not available to us in the Academy Awards show footage of 1963. 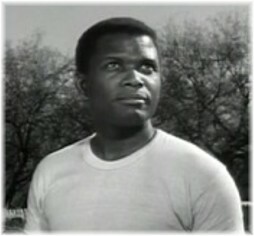 I was unable to discern whether Sidney Poitier actually received a standing ovation but the applause sure made it sound as if he did. Since he was the first Black Actor to receive an Oscar, this writer finds it fitting that he be noted regardless. 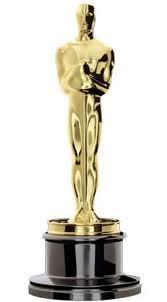 Wendell- I am an avid movie buff and never miss the oscars I have often have thought about these points. Very well written and insightful. It would be a great forum discussion… I would love to hear what some actors have to say on the subject…thanks so much for the food for thought. Keep writing!! Thanks so much for reading. Hopefully somewhere they are having these discussions. I think there is way to much fear and sensitivity around the issue of race … so much so that it begins to look and act very much like insensitivity. I would love nothing better than to write myself out of business when it comes to the issue of race and more specifically, race in America. While I must admit I haven’t travelled abroad much at all (anyone reading this feel free to take that as an invitation to send me somewhere to learn), I am sure race rears its head in other countries. However, I don’t get the feeling that it is as palbable as it is here in America. I offer this epiphanic moment while watching the BBC TV show, Luther, starring Idris Elba. It’s like a cross between Columbo, CSI and Law & Order but it is violent and gritty. If you can handle the violence it is an intersting show that I enjoy. What I came to notice – albeit after I had finished the first season – was race was never at issue! As I looked back and realized that Luther was a quirky yet well respected (the best crime solver) on the force … and he is black. When we meet Luther, he and his wife are in the process of or have already gotten divorced but he still loves her. The stress and craziness of his job and what it does to him has apparently made living with him for his wife, unbearble at best … and she is white. Throughout the show, though there are not many characters of color, it wasn’t disconcerting to me because Elba’s Luther was the shows namesake and everyone sounded pretty much the same; there was no code switching in the show – everyone was just a British person. Race was not a characer as it seems to be here in America. I think you may have made me talk myself up on a topic. Perhaps I have spoiled the opportunity for you to have the same epiphany but for me, it was quite refreshing.